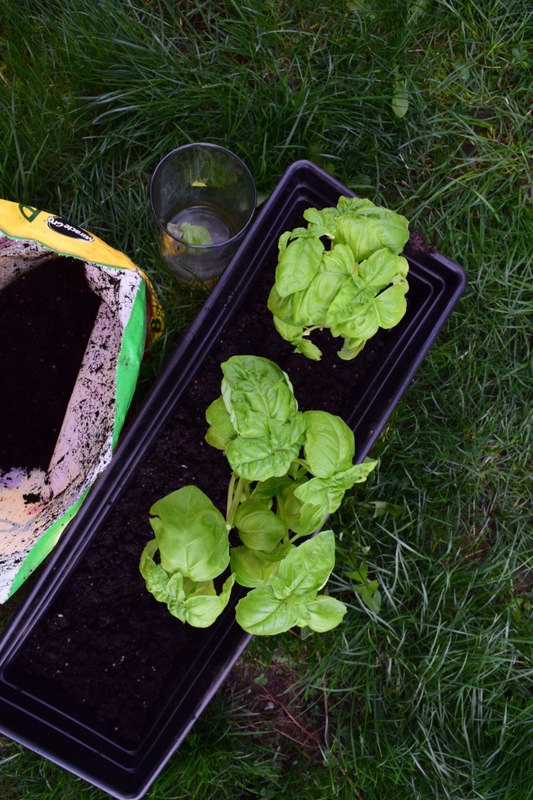 ﻿From the Grocery Aisle to Garden – How to grow veggies from your kitchen scraps! – Abbey Co. I was also born without a green thumb, and have never managed to grow a garden successfully on my own. A good yard in my book has no weeds and the lawn is mowed… my abilities are basic. Being foodies and understanding the impact that fresh ingredients have on a finished dish, my husband and I both terribly want to grow a successful garden. Plus, how nice would it be to walk out into the yard and grab some fresh lettuce for a salad on a hot summer day? Home-grown Rosemary and Thyme?? Don’t event get me started on how amazing that sounds! 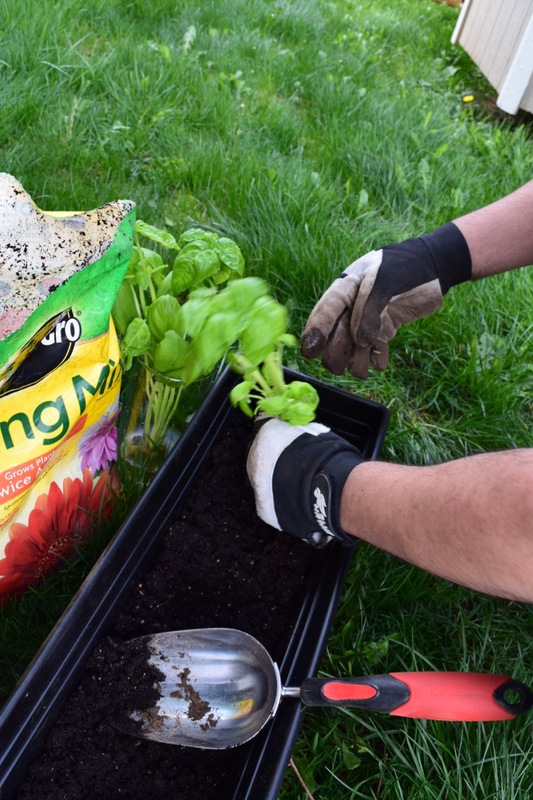 Having great doubt in our ability to successfully grow plants and herbs from seeds, we decided to skirt that by using starters. The catch – these starters are leftovers of plants we bought at the grocery store! It first started with a basil plant. We were making fresh pasta sauce, and my husband bought one of the ‘roots on’ basil plants from the grocery store (versus just the leaves). 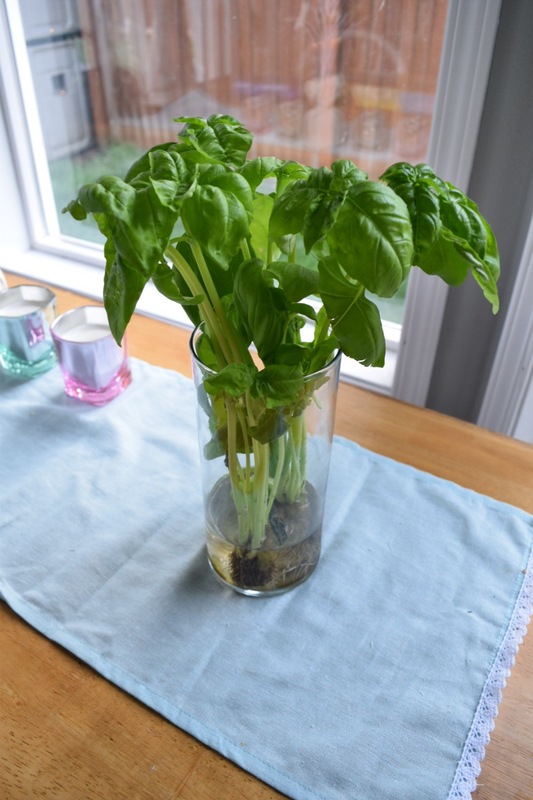 After plucking what we needed for dinner, we placed the remaining plant in a vase of water and let it grow for a week on the kitchen table in the window with some indirect sunlight. A week later, it was thriving!! The next plant we decided to try was some butter lettuce. Costco had this crazy good deal on 2 full heads of butter lettuce with roots for $3! They came home and became our next guinea pig. We ate the leaves but saved the roots, and placed them in a little salsa bowl to get growing. 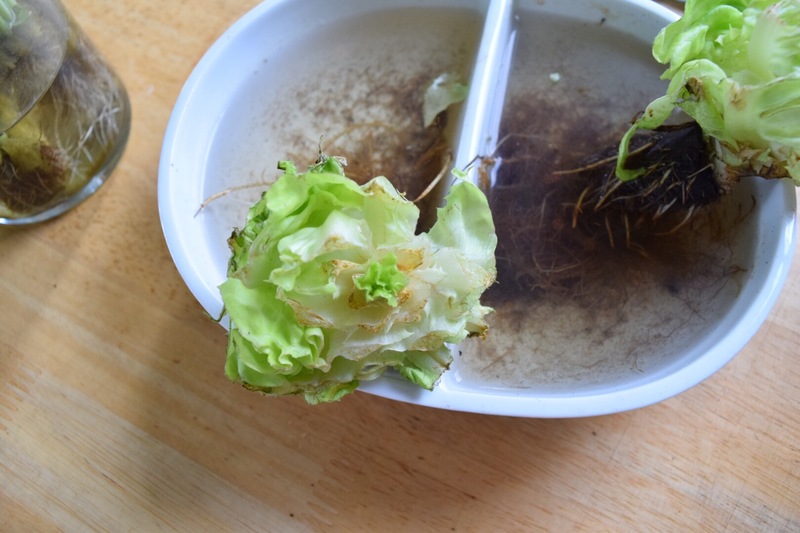 Within a day the center of the heads of lettuce were sprouting new leaves!!! The next logical step we figured was to plant them! We are in the process of building some raised garden beds, so we just bought them a temporary planter so they could get used to life outside. So, into the dirt they went! 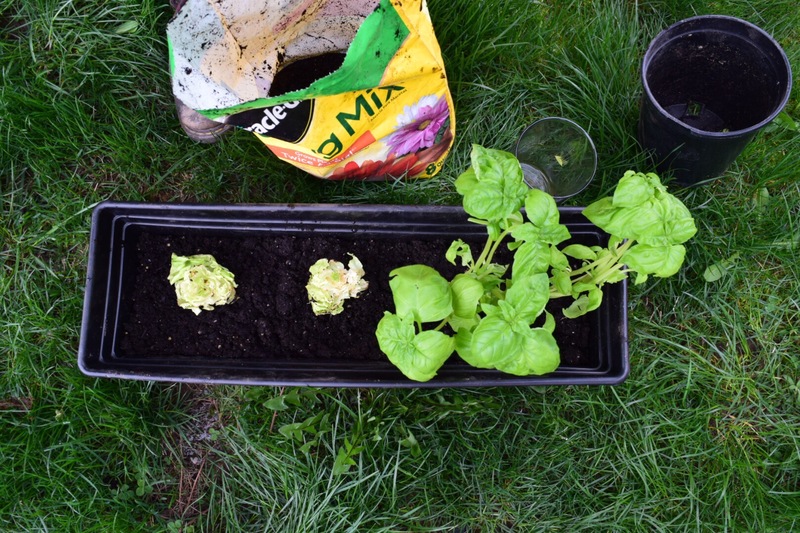 We are having a cold spring in Seattle, so the basil wasn’t happy to be outside at first, but the lettuce took off! 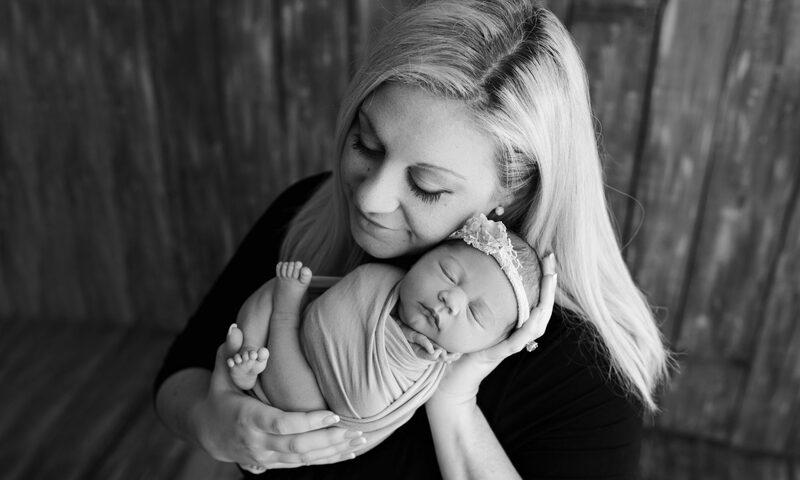 I never imagined it would grow so quickly. This past Costco run we picked up a 6 pack of Romaine lettuce (not pictured yet) that didn’t have roots, and even just putting the ends in water they are doing amazingly too! It looks like we are now successful gardeners using our veggie scraps from the grocery store! I will keep posting ideas that work as we come across them. I had no idea that you could do this. I knew you could take the seeds and sprout them, but not the scraps! What a clever idea! This is awesome! I’ve been wanting to start my own garden for a really long time now, I had no idea you could use leftover food. I’m definitely going to try this, thanks so much for the tip! Very cool. ^_^ I’ve done this with romaine lettuce before. “They came home and became our next guinea pig.” – I first read this as you gave the lettuce TO your guinea pigs, lol. We plant the white part and roots of green onions (scallions) all the time. They even live through the cold snowy winters here and spring right back after the snow melts! We just did some of those this week! What a great idea. I had no idea you could do this! I am going to have to try this myself! Pingback: Meatless Mondays are Back! Black Bean Torta w/Coconut Chipolte Mayo from Thug Kitchen – Abbey Co. Previous PostPrevious Monteillet Fromagerie, Farm Fresh Homemade Cheeses… Visit them in Walla Walla!